Our phone message service can place one call or millions of calls. Pre-recorded messages can be played to either individuals and answering machines or just to individuals. Different messages can be played to an answering machine versus an individual. Contact DSC today. to learn more about our voice broadcasting service and auto dialer phone systems. This article appeared in the October 30, 2002 issue of the Local Victory Newsletter. Every campaign, no matter how small, should have a plan in place to make get out the vote (GOTV) calls in the days leading up to Election Day. Ideally, your campaign will have kept a list of supporters over the course of the campaign, drawing on all of your campaign activities to grow and cultivate that list (for more information on growing a GOTV list, see Local Victory�s recent article Getting Out the Vote (Part I). If your campaign has built such a list, then this is the list that will form the basis of your phone operation. Preferably, each person on this list will receive at least one phone call from your campaign, in addition to any other get out the vote activities your campaign will conduct. Of course, many campaigns reach the final weeks of the cycle and realize that they need to make calls but haven�t kept such a list. Not to worry, there are still calls to be made. GOTV calls are so important that you still need to do them, even if you haven�t kept a formal list of supporters. The key to effective GOTV calls, and get out the vote activities in general, is identifying who is likely to support you and motivating them to go to the polls. The first step in building any get out the vote list is gathering the names and phone numbers of all of the candidate�s friends and family who are registered to vote in the district in which the campaign is being run. Add to that list all of the volunteers and donors to the campaign who live in the district and are registered to vote. Ask your volunteers to list any friends or family who they know support the candidate and are registered to vote in the district. For the campaign that starts early, this is just the beginning of the GOTV list. For the campaign starting just days before the election, this list may be your entire get out the vote call list. Your GOTV call operation should begin as early as it takes to complete a call to every person on your list, but not so early that the people you call will forget that you called. Remember � our goal is to get the people on that list to go to the polls. For that reason, the closer to Election Day that you make your calls the better. A good rule of thumb is to try to start making calls no earlier than the Wednesday before the election (Thursday is better) and to wrap up your calls on Monday night, the day before the polls open. Remember not to call too early or too late. Early-late evening works best. If no one is home, leave a message on the answering machine and count it as a �completed call.� If no one is home and there is no answering machine, mark that number to be re-called later. 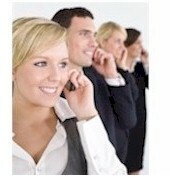 If you�ve built a large call list, consider finding some volunteers to help you make your calls. Be sure to train them properly � provide them with a script for making the calls, goals for when they need to be complete, etc. Preferably, your volunteers will be able to work out of your campaign headquarters so that you can closely supervise their activities. If this is not possible, then have them make the calls from their own homes. In this case, training is especially vital. Short and simple � Say the candidate�s name and the office he or she is running for at least twice, tell them when the election is, and move on to the next call. What is Interactive Voice Response (IVR) and Voice Broadcasting (VB) and how can it be applied to different ivr applications? Visit our Call Center Outsourcing web pages to learn more about these products and services. Contact DSC to learn more about our IVR services and IVR software solutions.